Depending upon the age of your children, we will make available age/gender appropriate toys, outdoor equipment and books – customising the cottage for your children! The full Budle Bay Croft Experience including animal interactions and egg collection, fields, trees, woodland, meadow, river, trampoline, woodland stage for those divas in the family, a large open fire pit for those Kumbaya moments and a fabulous tree house with horse swing, slide, climbing ladders and trapeze! We may have more than you can see in the gallery and videos, and we may have different things – we constantly evolve! 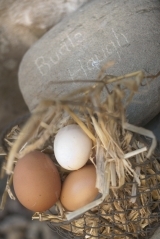 Of course, well behaved dogs are welcome at Budle Haugh – and we spoil them too – doggy basket, bowls and treats provided to help get pooch’s holiday off to a great start! 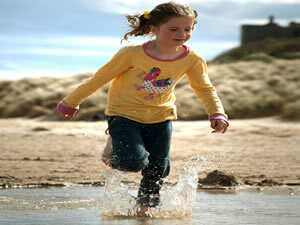 We have been rated Family Friendly by Visit Britain Quality I Tourism. 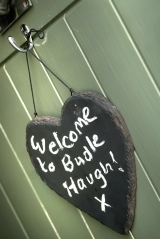 We love welcoming children of all ages to Budle Haugh, and we know they will be delighted by all this cottage has to offer. Inside the cottage there is a mix of technology diversions such as the iPad, Playstation 4 and TV/DVDs, but there is also the more traditional time occupiers, including games, toys, dressing up clothes and books. We even provide bath toys! 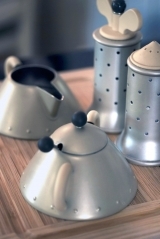 To make things easier for mums and dads, we always have sippy cups, plastic plates and cutlery in the cottage, but we can also supply a wide range of that vital stuff the little ones need including high chair, step up stool, potty, changing mat, baby bouncer chair, nursing cushion, travel cot with comfy mattress, moses basket, cot linen, baby monitor, steriliser, baby bath and cot side – all free of charge. Please remember to let us know what you would like when you make your booking. 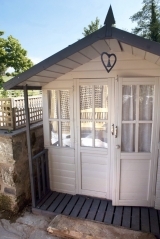 Outside the cottage, the little ones will enjoy the secure private walled garden with ride on tractor, sand pit, outdoor toys and a little summerhouse! 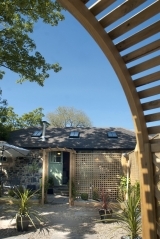 Over and above the cottage and private garden, our younger guests can enjoy the Budle Bay Croft Experience to the full. 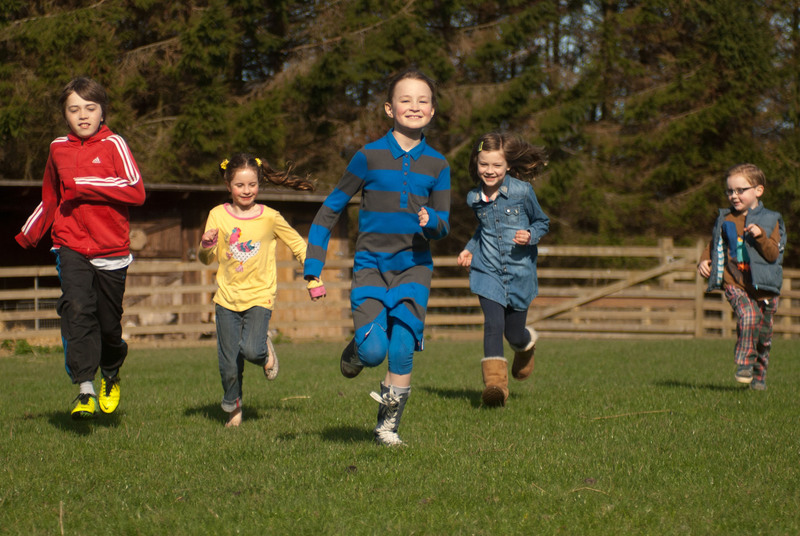 They will love to play Pooh Sticks over the little bridge and run free in the woods and paddocks, spotting signs or even catching a glimpse of the vast array of wildlife including foxes, badgers, rabbits, deer, woodpeckers and bats. 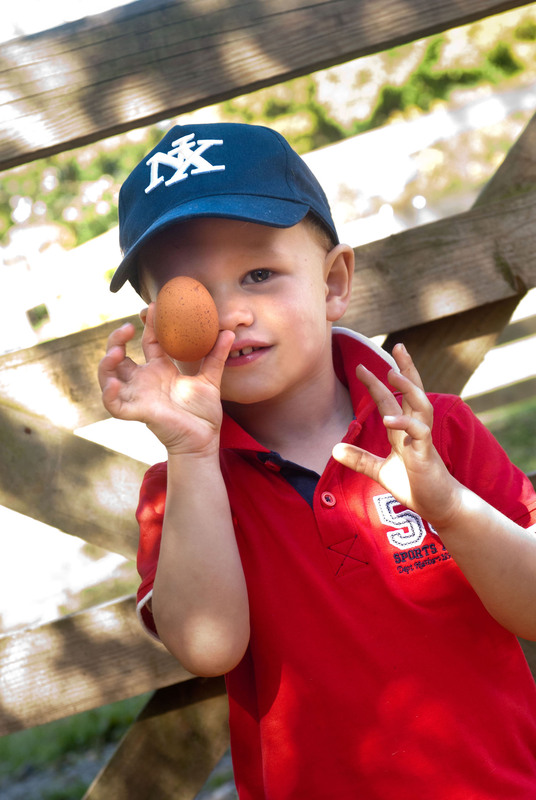 All of our little people enjoy the animal interactions, feeding and tickling the pigs, sheep, ducks and chickens. At lambing time, they can bottle feed the orphans and even hold the new borns. And they can enjoy the outdoor climbing areas, trampolines, stage and marshmallow toasting camp fire too! There is a shared supply of buckets and spades and beach paraphernalia in Shark Shed. Over and above all of this, there are often children at Budle Falls, the neighbouring cottage, as well as the owner’s children to make friends with. We have been rated Pet Friendly and we are not surprised – we love welcoming pets! There are acres of grounds for dogs to run and play, and we provide a dog bed, bowls and treats too. We even have a private and enclosed garden for them to play in! We can organise doggy day care if you need it (vaccination certificates required), although many local attractions and activities are dog friendly. Dogs are welcome to enjoy their holiday on Northumberland’s beaches year round, and Bamburgh beach is huge and close by. We can even recommend local restaurants that welcome our four legged family members – no compromise for them or you! Why not check out our dog blog on just how dog friendly Northumberland and Budle Bay Croft actually are? We do not charge you for bringing your dogs on holiday but if they cause damage, or leave mess to be cleaned up after you depart, you will be invoiced accordingly. We think this the fairest thing to do as most dogs are just great and everyone should not have to pay for the very few that cause issues. 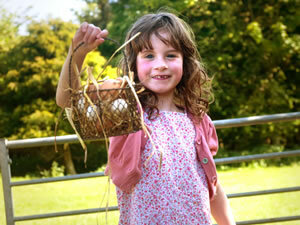 Ideal for a family as children will love the play area, farm animals and Budle Bay Croft Experience. 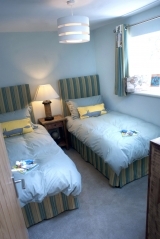 Would be wonderful booked with neighbouring Budle Falls for 2 families wanting to holiday together but wanting their own private space too. 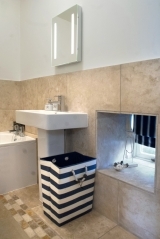 A couple or 2 couples holidaying together would appreciate the style, luxurious touches and the outside space for walks or even private fishing on the river. 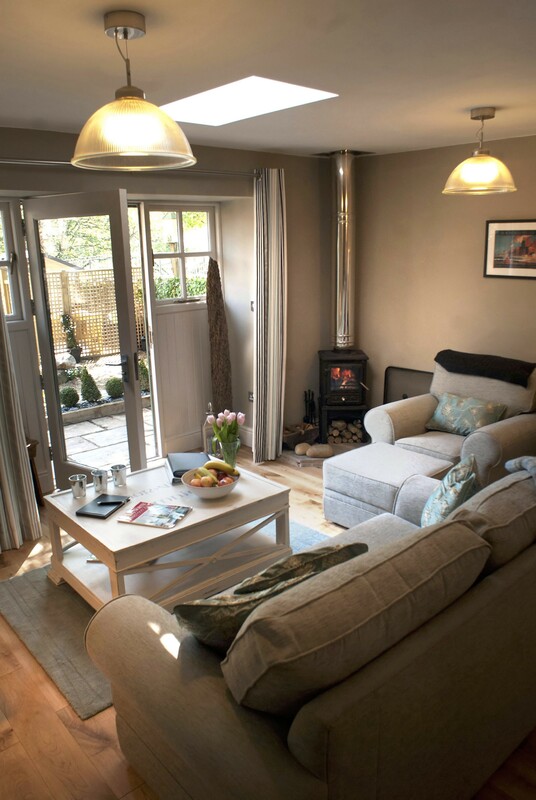 If you fancy a holiday on your own, Budle Haugh is rural but not isolated, and the cosy cottage will offer a safe and comfortable welcome. You will also have all the communications facilities at your fingertips to keep in touch with those you decided to leave behind! For girlie get togethers or hen parties, why not book Budle Falls with Budle Haugh for a decadent weekend of fizz, chocolates, fine dining, high tea and pampering, with special discounts on beauty treatments – just ask for details on booking. You can also enjoy more energetic pursuits such as riding, boat trips, shooting, and cycling, all of which can be pre-arranged. 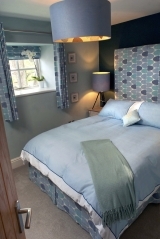 And lads, don’t feel left out, because we can offer short breaks tailored to your needs too – how about local beers and outdoor pursuits such as kite surfing, fishing, diving and shooting. Again, discounts can be arranged – just let us know your requirements at the time of booking and we will do our best to ensure your break is a great one! 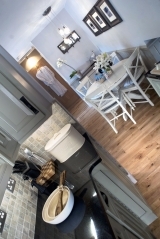 Budle Haugh is a perfect holiday cottage with great reviews. 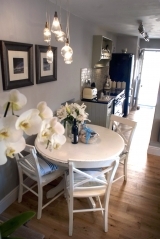 The living space is compact but very cleverly designed and beautifully presented, and you should find all you need. The Budle Haugh access statement is available here.